I was in Bristol last week to ‘deliver a lecture’ (a grand way of saying ‘busk for forty minutes’) on the subject of the Wesleys in that city. Bristol is second only to London in importance to the history of Methodism (some would say first), for it was there in 1739 that John and Charles Wesley took to preaching in the fields outside the city when their eminent, if cross-eyed, predecessor, George Whitefield took off for the New World and the Great Awakening. In Bristol the Wesleys built the New Room, the first Methodist church, today lovingly preserved in all its eighteenth century orderliness, although, rather tellingly, there’s architectural evidence at odds with that aesthetic. The windows are noticably higher than in other eighteenth-century buildings and the double-decker pulpit, accessed by a single staircase, gives onto a bolt hole, a kind of prototype safe-room, wherein John Wesley could take refuge when his sermon so inflamed the congregation that he risked being attacked – hence the high windows, harder to heave a brick through than those at ground level. Methodism is sometimes thought of as being all about Beetle Drives and fellowship-in-the-jammy-dodgers, an unkind caricature which fails to give due acknowledgement to the movement’s roots in eighteenth-century radicalism. Wesley and his followers offended the Established Church and were barred from its pulpits (although he never left the Church of England, thinking it better to be the leaven in the lump), and offended Bristol’s City Fathers, many of whom had grown immensely rich through the import and export of slaves. Wilberforce is, I suppose, the great hero of the Abolitionist movement, much celebrated during the bicentenary of the abolition of the slave trade in England in 2007. But fifty years before Wilberforce, John and Charles Wesley were delivering fiery abolition sermons to the slavers themselves; O burst thou all their chains in sunder! Thou Saviour of all, make them free, that they may be free indeed!, preached John to an uncomfortable congregation. We don’t know if he needed to retreat to his safe room after that or not, but it makes our rattling of the poor box seem very small beer. But rattle it we do, especially during the Lent Appeal, in aid of this Diocese’s link projects in Angola and Mozambique. It is not only right that this city, which did so nicely out of Africa in the eighteenth and nineteenth centuries, should send some of its wealth back to support African hospitals and schools in the twenty-first; it is also right, as the Archbishop of Canterbury often, wearily, reminds us, that Christians in Britain support the Anglican Communion, because we are bound one to another, across distance and culture and custom, by our common confession – Jesus Christ – yoked together not by the chains of slavery but bonds of affection. Am I not a Man and a Brother?, asked the shackled African on Josiah Wedgewood’s abolitionist commemorative plaques. We only have to adjust that slogan for gender inclusiveness to make it as relevant for our times as for his and Wesley’s. Celebrant & Preacher Fr Nick Mercer, with Godly Play for children. Celebrant & Preacher Fr Alan Gyle, with Godly Play for children led by Bianca Dally. You are receiving this email from St Paul’s either because you are a regular worshipper or because you have elected to go onto our email distribution list. If you wish to be removed, please don’t hesitate to let us know. Best wishes, Fr Alan and the team. Unsubscribe nick.mercer@london.anglican.org from this list. Copyright (C) 2010 St Paul’s Knightsbridge All rights reserved. St Paul’s Knightsbridge (www.spkb.org) is an Anglican church of Anglo-Catholic tradition in central London, part of the Diocese of London (www.london.anglican.org) and the Church of England (www.cofe.anglican.org). To contact us,please either call +44 (0)207 201 9999 or email us: pa@spkb.org OR you could call in and visit in person. We are open for prayer seven days a week from 9am until after the evening mass. The clergy are happy to visit those unable to come to St Paul’s – or to meet you at the church. Please pray for us – as we will for you. 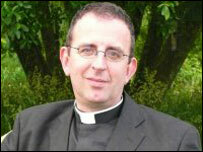 Vicar: Fr Alan Gyle; Senior Curate: Fr Richard Coles; Assistant clergy: Frs Nick Mercer, Graham Palmer and Andrew Norwood.